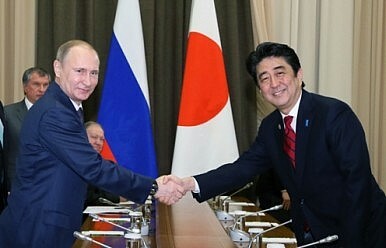 Relations between Russia and Japan are tense, owing in part to the general slump in relations between Russia and the West. Russia was expelled from the G8 for its annexation of the Crimean peninsula from Ukraine last year. Russia remains under economic sanctions from the United States, the European Union, and Japan for its actions in Eastern Europe. Tokyo has been reluctant to pursue an independent foreign policy toward Russia, and Abe has largely toed the same line as his counterparts in the West. Specifically, the controversial shooting down of Malaysian Airlines flight MH-17 last summer forced Tokyo’s hand to impose sanctions on Russia. At the recent meeting of the G7 in Germany, Abe tried to play off European concerns about Russia’s actions in eastern Ukraine — where Moscow supports rebels against the Ukrainian government — to elicit similar attention on China’s actions in the South and East China Seas. Before Russia’s isolation from the West, it appeared briefly that Moscow and Tokyo were set to make progress on the resolution of their long-standing territorial dispute over the Kuril Islands, a set of islands running northeast from Japan’s Hokkaido Island to the southern tip of Russia’s Kamchatka peninsula. However, given present geopolitical realities and Tokyo’s insistence on siding with the West, Russia has tabled the matter for the moment. As The Diplomat noted just weeks ago, Russia’s defense minister, Sergei Shoigu, announced that Moscow would accelerate the construction of military and civilian infrastructure on the disputed Kurils. The Kuril dispute remains gridlocked once again. Still, the oddity underlying Japan’s bilateral ties with Russia at this point is that Putin and Abe actually have a close rapport and both leaders see space for their countries to work together for mutual benefit. Abe became the first Japanese prime minister to visit Russia in 10 years when he went in April 2013, and since then, he and Putin have met on 10 separate occasions. Without Russia’s split with the West, the Russo-Japanese relationship could have been in a very different place today. When Putin and Abe meet later this year, they’ll both be aware of that.